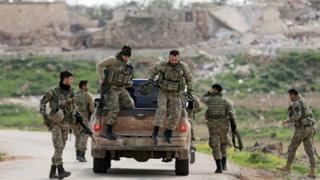 The Turkish military says it has surrounded the Kurdish-held city of Afrin in northern Syria, the focus of an offensive against a Kurdish militia. A statement said troops and allied Syrian rebels had also captured "critically important areas". A Kurdish source confirmed that all roads into the city were now being targeted by Turkish shellfire. Hundreds of civilians reportedly fled the city to nearby areas controlled by the Syrian government on Monday. Why is Turkey targeting Kurdish forces? The Turkish operation aimed at driving the Kurdish People's Protection Units (YPG) militia out of Afrin began on 20 January. Media captionAfrin: What is going on in Syria's other battle? The Turkish government says the YPG is an extension of the banned Kurdistan Workers' Party (PKK), which has fought for Kurdish autonomy in south-eastern Turkey for three decades, and considers it a terrorist group. The YPG denies any direct organisational links to the PKK - an assertion backed by the US, which has provided the militia and allied Arab fighters with weapons and air support to help them battle the jihadist group Islamic State (IS). 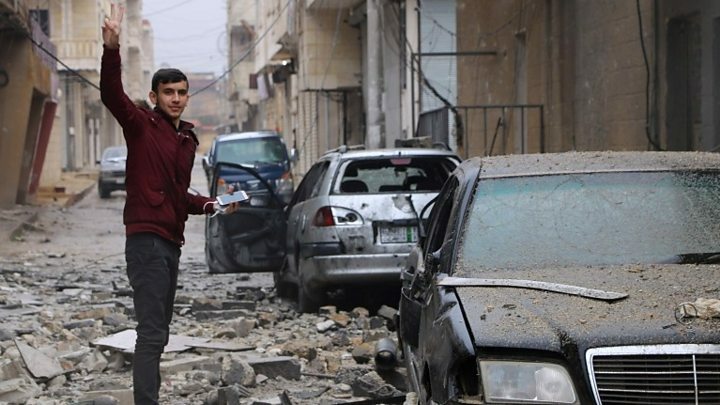 The Syrian Observatory for Human Rights, a UK-based monitoring group, confirmed that Turkish-led forces were besieging Afrin, 90 villages and a nearby town on Tuesday. The only road out was in range of Turkish artillery fire and was therefore impassable, it said. YPG spokesman Nouri Mahmoud acknowledged that all roads in the area were being targeted by Turkish bombardment. But he told Reuters news agency that Afrin had long been surrounded "from all directions", and that Turkey was spreading false news to boost morale. The Great Escape is the headline of a flagship Turkish newspaper, accompanied by pictures of civilians trying to flee Afrin. The Turkish military says it has encircled the town and that it has set up a corridor for civilians to escape the fighting. Surrounding the city is a key step in Turkey's seven-week operation in northern Syria aimed at ousting the YPG militia from the region. But it remains unclear what Turkey's next move will be. Some say Ankara will be content to lay siege to Afrin for some time and allow civilians to leave to avoid a high-casualty offensive. On Monday, UN Secretary General Antonio Guterres told the Security Council that the battle for Afrin had "resulted in significant civilian displacement with reports of numerous casualties and damage to infrastructure". About 324,000 people were living in the Kurdish enclave before the Turkish offensive began, according to the UN. The Kurdish Red Crescent says more than 230 civilians, including 35 children, have been killed and 688 others wounded since then. However, the Turkish military denies targeting civilians or civilian infrastructure. It says 3,393 "terrorists" have been "neutralised" - a term it uses to describe those who have surrendered, been captured or killed. The YPG meanwhile says it has killed hundreds of Syrian rebels and Turkish soldiers. The Kurdish authorities are reported to have prevented displaced civilians from passing through official checkpoints into government-controlled areas except for medical cases. But as many as 830 families were believed to have fled through unofficial routes by Monday, the UN said. Turkey has also threatened to start an operation to clear YPG fighters who are deployed in Manbij, a town 100km (60 miles) east of Afrin, as part of the US-backed Syrian Democratic Forces. On Tuesday, Turkish Foreign Minister Mevlut Cavusoglu said a deal had been reached with Washington for the YPG to withdraw from Manbij and for Turkish and US soldiers to be stationed there to "ensure its security". The fighting in northern Syria came as a group of sick and injured civilians were evacuated from the rebel-held Eastern Ghouta outside Damascus, which is under siege by government forces. State TV showed people in wheelchairs and on crutches arriving at the al-Wafideen checkpoint on Tuesday, a day after the rebel group Jaysh al-Islam said it had agreed with the government's ally Russia to begin medical evacuations. Jaysh al-Islam later stressed it was not negotiating to leave the Eastern Ghouta and would continue to fight, even though the government has recaptured 60% of the enclave since mid-February and more than 1,100 civilians have been killed. Video Why are Nato allies confronting each other in Syria?